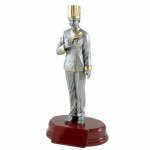 Cooking trophies, resin awards and gifts are great for cookin competitions and special events. 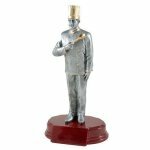 Whether you need an economy trophy or a more elaborate award, you are sure to find the perfect cooking award. Our cooking awards make great chef award, chef trophy or chef gift. FREE Shipping on orders over $100. FREE Engraving. The Female Chef Award is ideal any cooking competition or as a thank you for that special cook. This resin award has a brushed gold laser engraved plate and black letters. This is a great choice for an economy cooking trophy. Choose a cheap cooking trophy for your team or tournament trophy event. FREE Shipping is available on orders cheap cooking trophies over $100. FREE Engraving.